interested in pure food and opposed to GMOs is “elite”. Elite Monsanto, afraid of the uprising against their toxic GM (genetically modified) food, are running out of excuses and defenses for their appalling actions. 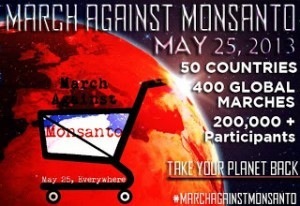 This Saturday, May 25, 2013, the March Against Monsanto will be taking place around the world, in around 50 countries with 400 marches and over 200,000 participants. It will be sending a strong and clear message to elite Monsanto and the other big Biotech firms (e.g. Syngenta, DuPont, Dow, Pioneer, Bayer, BASF, etc.) to stop tinkering with our food and spraying pesticides on it – actions which have already resulted in loss of plant biodiversity and loss of animal and human life, through organ damage and cancer (see Jeffrey Smith’s super informative film Genetic Roulette for more information). It is unprecedented – the first time that the entire planet has come to together to spread awareness and stand up against one corporation. However, Monsanto has become such a behemoth that it has infiltrated and overtaken the US Government, allowing to dictate US foreign policy and write its own laws. The world is angry and disturbed by the threat of GMOs. Recently even Russian President Putin blasted US Secretary of State John Kerry for US support for GMOs. Twisted logic: elite Monsanto claims anti-GMO activists and organic food consumers are “elite” !? In a clear case of twisted logic and psychological projection, Monsanto, one of the largest and most elite corporations in the world, is turning around and claiming that those who oppose GMOs are elite! Go figure. Elite Monsanto is trying to paint a picture of itself as a victim who is altruistically trying to save the world. Nothing could be further from the truth. Monsanto’s aim is to control the food supply of the entire world, by owning the patents, genes, seeds and therefore food on every farm of the planet. Monsanto’s cunning PR campaign is to demonize those who want to know what’s in their food (GMO labeling activists), as well as those who want access to non-GMO, pure food (organic consumers), and label them snobs or elites. Monsanto CEO Hugh Grant said, “There is this strange kind of reverse elitism … there is space in the supermarket shelf for all of us.” If Monsanto were selling harmless, safe products, that would be fine. But they’re not. They’re pushing dangerous, genetically-spliced food onto the population, knowing how toxic it is, while serving organic food to their own workers in their company cafeteria! Historically, elite Monsanto is a chemical company that is now peddling GMOs to increase its sale of pesticides. They deal in poisons. They profit from war. They even contract regularly with Blackwater, the private mercenary company infamous for killing innocent civilians. Let’s hope we raise enough awareness to put them out of business permanently, and stop them destroying our planet.